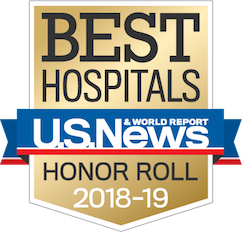 While no day is ever the same, today will be an extra-busy day for Karleen Wray, Child Life Specialist II at UCLA Mattel Children’s Hospital / Ronald Reagan UCLA Medical Center. Early arrival is typical for Karleen. Her commute, a quick 20 minutes, but with a 5:30 am start time, traffic is barely a concern—a Los Angeles rarity. 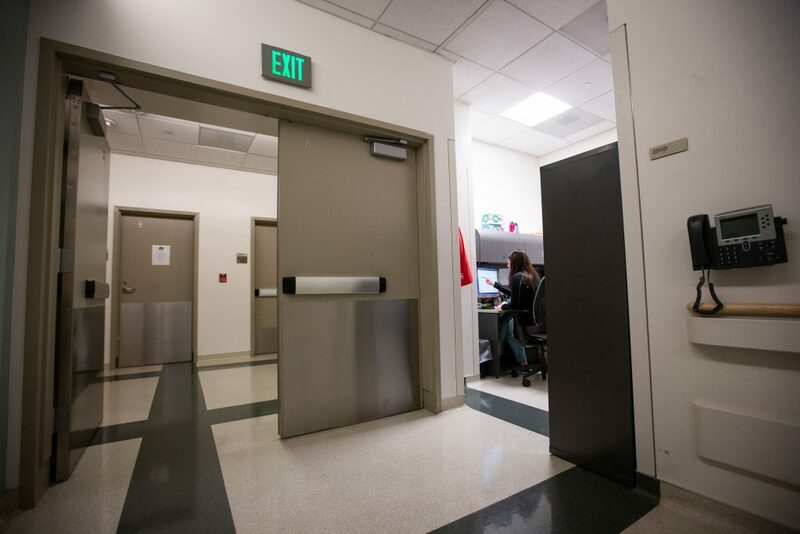 Today will be a busy day; 16 pediatric surgeries on the schedule. Karleen shares her concern about families not agreeing to be photographed, “I’m worried we won’t get any families to say yes.” Her first family politely declines. 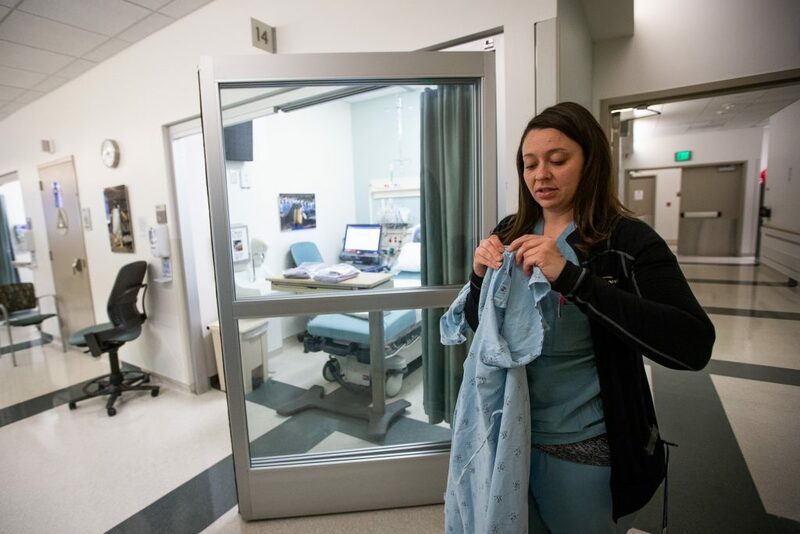 Tucked away in an unassuming corner of the OR, Karleen stays up to date on the surgery schedule for the day. Fully understanding the surgical procedures is essential for Karleen to estimate, and mentally map out her day. A 4-hour surgery goes in at 8 am, a 2-hour surgery goes in at 8:30 am. It’s important for Karleen to know where she needs to be and when. The patients, unknowingly, will be counting on it. Two-year-old Genesis timidly arrives at the OR. Her Spanish-speaking parents find comfort in Karleen’s ability to speak their language, and speak it well. Bubbles seem to be the cure to calm young nerves; Karleen quickly earns Genesis’ trust. A more acclimated Genesis is provided an opportunity to change into a hospital gown. Appearing simply as courtesy or kindness, freedom of choice is deliberate, and a theme that will run throughout the day. Child Life Specialists are taught a technique called a Stress Potential Assessment, which trains them to assess a patient prior to meeting them in order to prioritize how they can most appropriately provide ample support to all of their patients throughout the day. 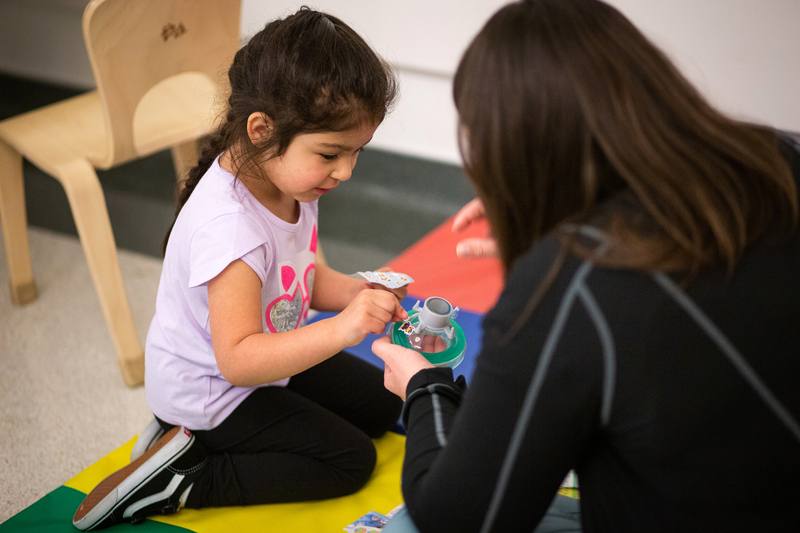 Shortly after an assessment, Karleen explains, “my passion is working with kids with special needs.” Three-year-old, David is sensory sensitive, typical for kids with autism. 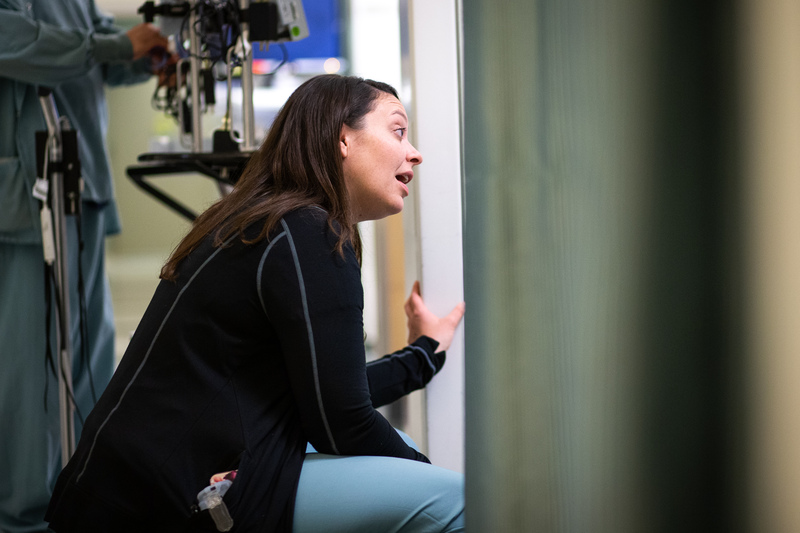 Karleen ensures all surgery preparations involving touch happen in the very last moments before David goes into surgery. The happy face drawn on Karleen’s hand serves as a decorative symbol for a job well done. 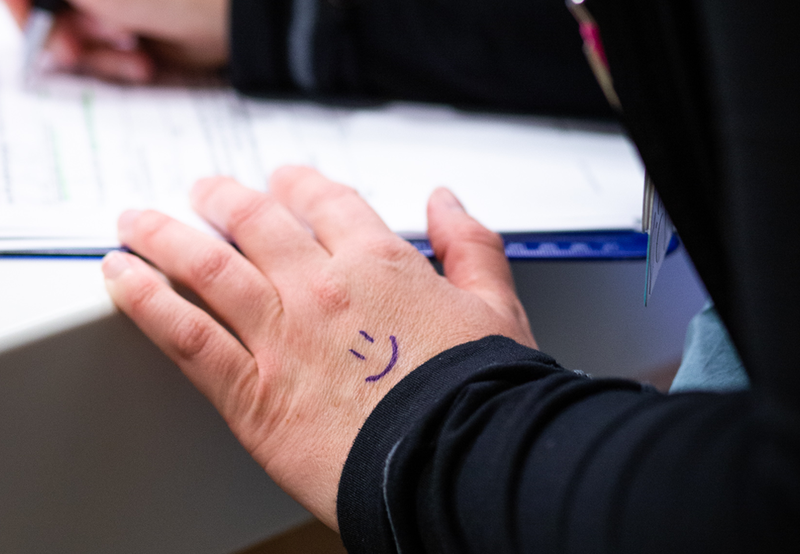 The journey to support a distraught patient, who needed to be marked with a Patient Identification Marker as part of standard pre-surgery procedures, started with allowing the patient to mark Karleen’s hand, then the patient’s father. The procedure, turned interactive play, eventually allowed the surgery team to administer their ID markers with ease. 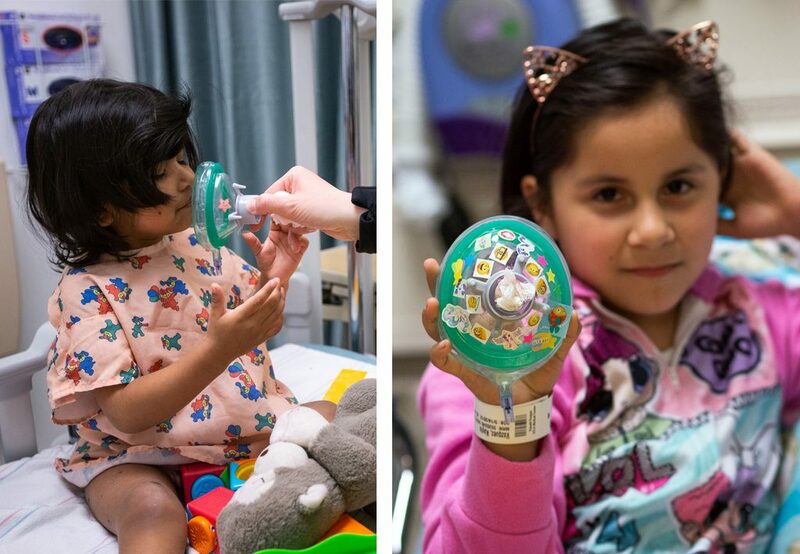 Stickers help Karleen quickly form a bond with 6-year-old patient Kayla. The stickers are used to decorate patients’ masks in order to create a positive association with the mask they will be wearing in the operating room. Once decorated, patients gets to choose a scented oil which gives the mask a pleasant odor. Genesis and Kayla choose strawberry. By 7 am, Karleen has washed her hands 15 times. “With hand sanitizer in between,” she proudly adds. 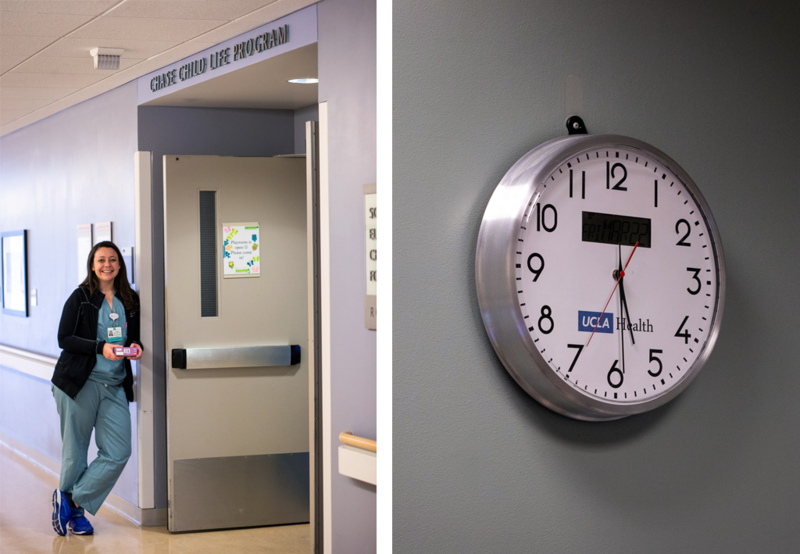 “Can you check on Johnny for me?” On busier days, Karleen has support from Child Life Specialists like Christynna and Anna who work on other floors. 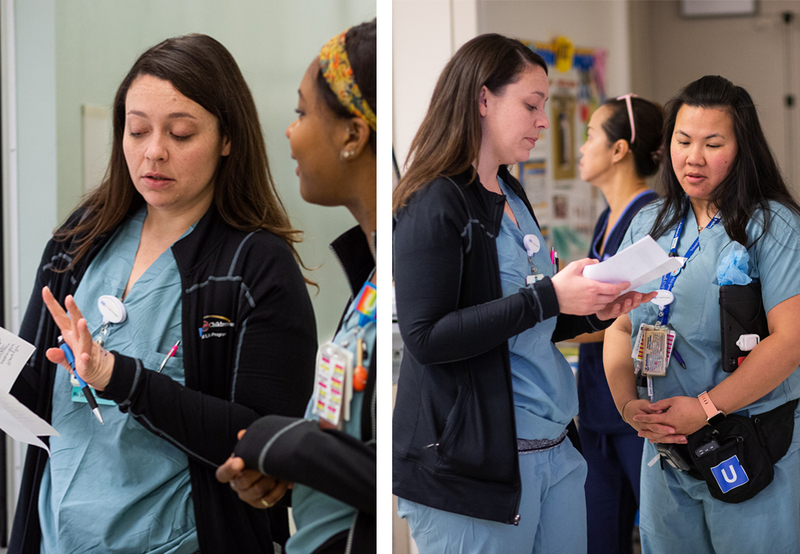 Our Child Life Specialists lean on each other to stay up to date on their patients’ medical journey. 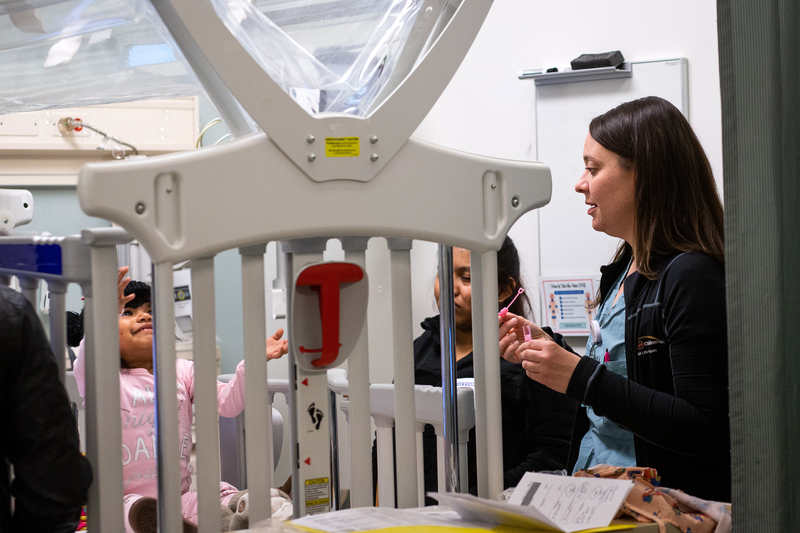 The Child Life team practices under the “Continuity of Care” premise: providing ongoing care to a single patient throughout their medical journey. 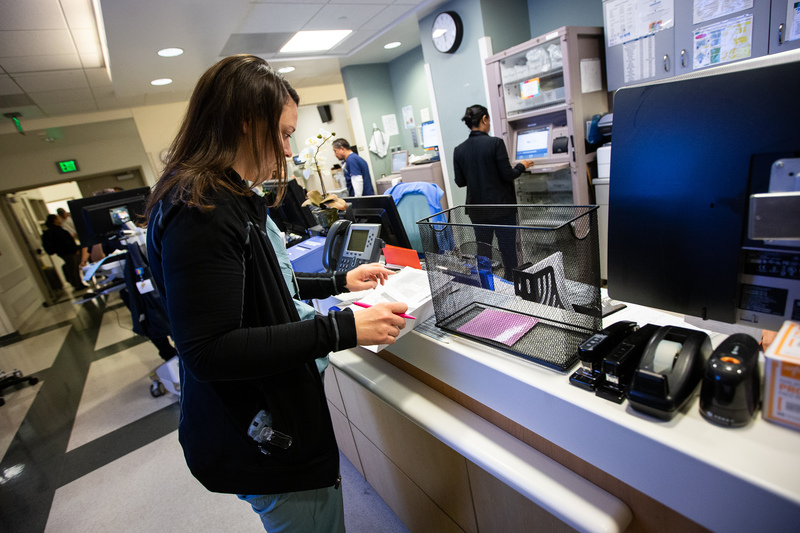 To do this effectively, charting (taking detailed notes) is essential to ensure other staff members know as much information about a patient as possible. In the OR, opportunity to chart comes in waves and every sturdy—and, sometimes not-so-sturdy—surface would double as Karleen’s writer’s nook. No rattle for 15-year-old patient Isaac. Having had multiple surgeries over the last few years, Karleen has gotten to know Isaac well. “He’s always warm. He calls himself a polar bear,” says Karleen as she runs to grab him an alternate hospital gown. "I try to think of our work as a box. On the bottom of the box are all the things we cannot control: diagnosis, surgeries or loss. But on the top, there are opportunities to support things we can control. 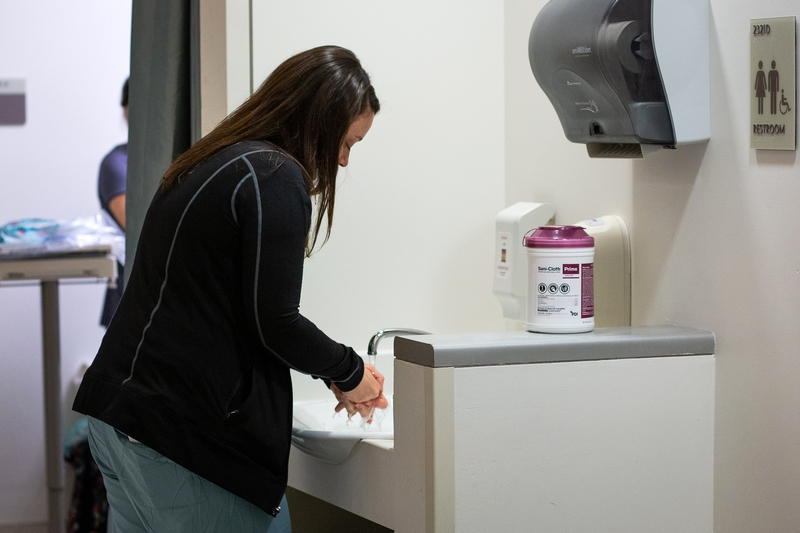 Focusing on that top layer allows us to best meet our patients’ needs and empower them." Sometimes the route is just as important as the destination. 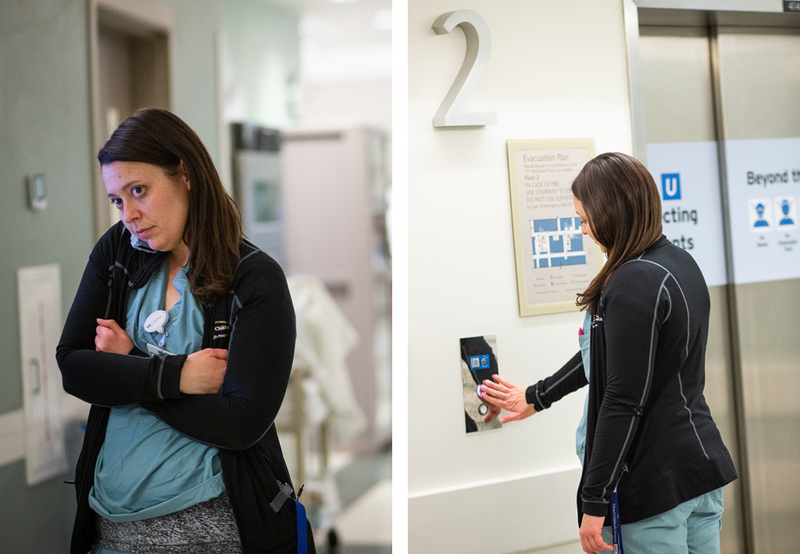 Karleen assesses the most appropriate means of transportation for her patient’s journey to the operating room. Whatever it takes to keep patients comfortable, nothing is out of the question, not even an impromptu Baby Shark performance. 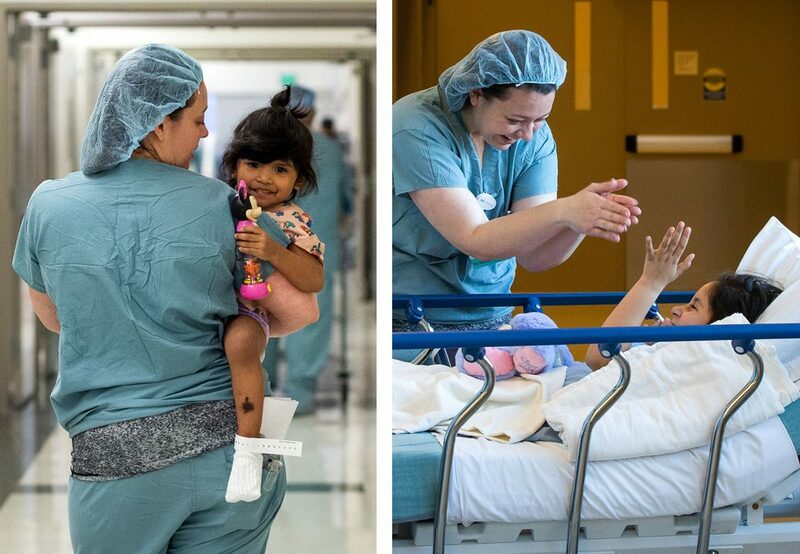 Child Life in the OR: Amongst doctors, nurses, and anesthesiologists, you’ll find Child Life. 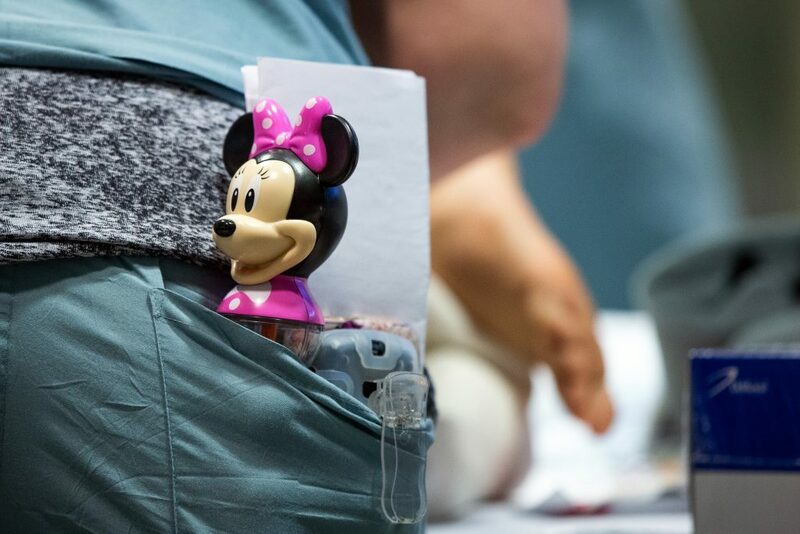 Armed with the anesthesia masks they decorated in the pre-operative area—and a couple essential tools for distraction—any pre-surgery anxieties keep a low profile. 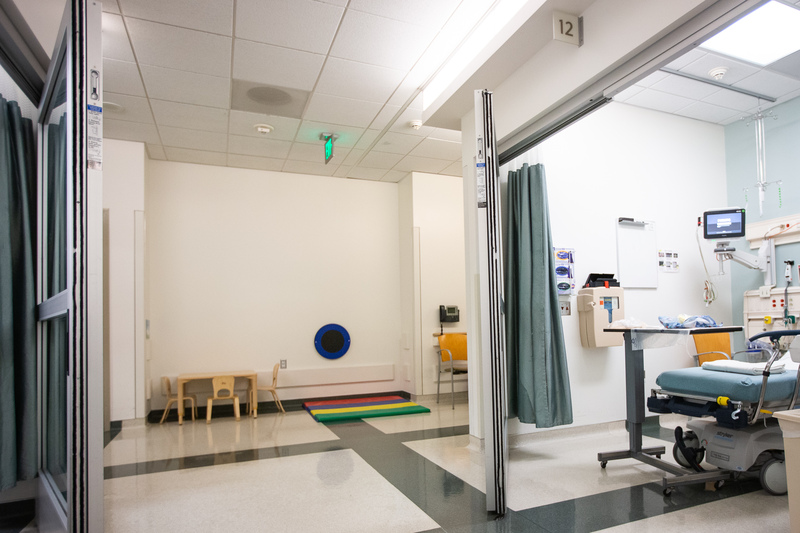 Once a storage area for various supplies, this unassuming play area provides young patients and their families the freedom to wait in a dedicated space that can act as a positive distraction while they await their procedure. 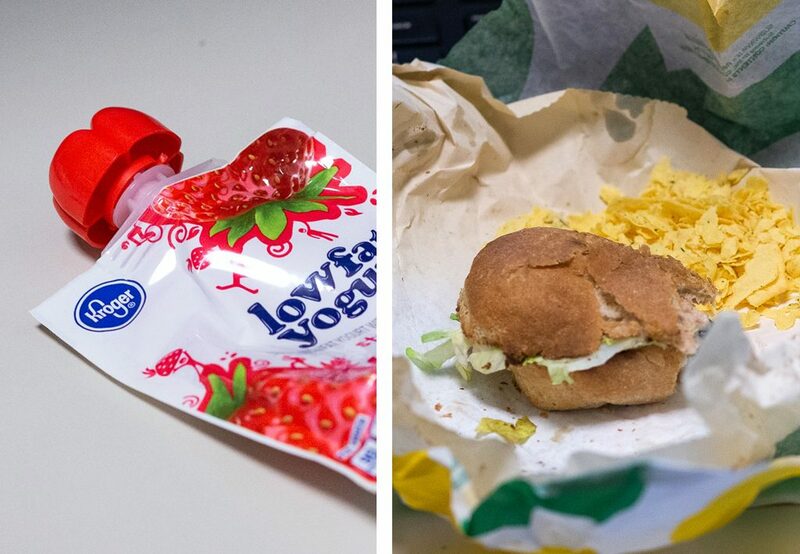 “I eat like a child. I have pouches and stuff.” Lunch is less relaxing and more a discipline for Karleen. 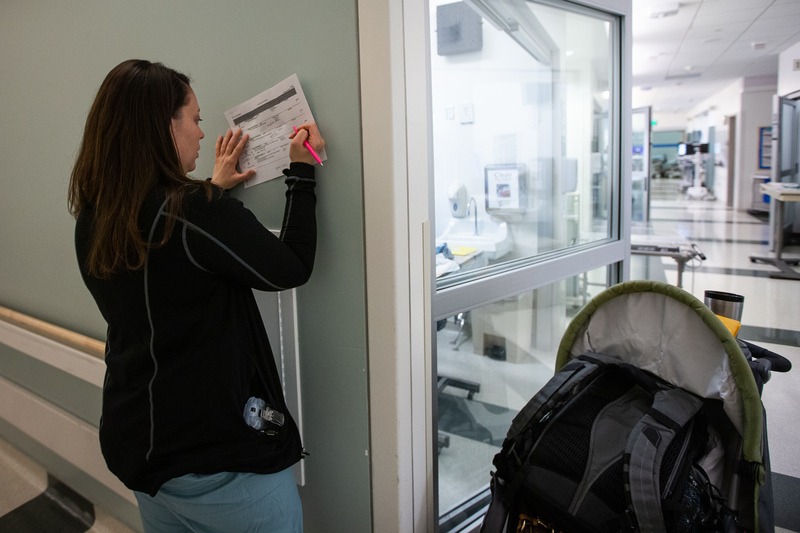 A sandwich—almost fully eaten—gives Karleen enough energy to head into the final leg of her busy day: her patient’s arrival to post-operative care. 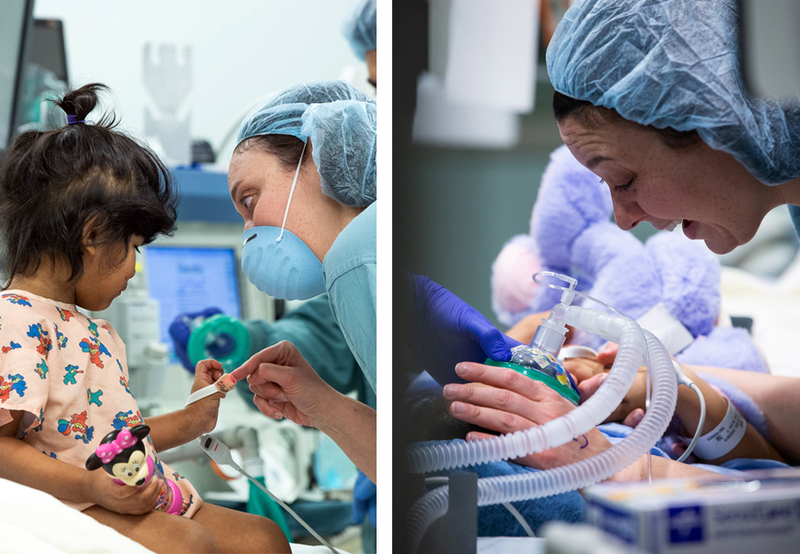 Post-operative care is where the relationship between the Child Life Specialist and the patient is most evident. A familiar face quickly becomes an important remedy for a child as they slowly wake up from the anesthesia. Instinctually, the Child Life Specialist becomes a stand-in figure of comfort, warmth, and safety until a parent arrives. This was the case with Genesis, who reached past a nurse for Karleen, who had arrived shortly after she woke up. 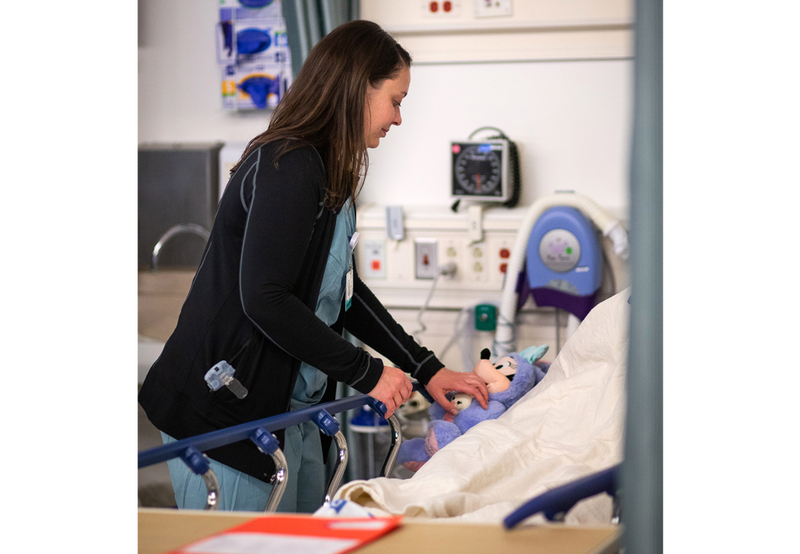 While Karleen can’t always be bedside at the perfect moment, anticipating her patient’s needs before they wake up has proven effective. 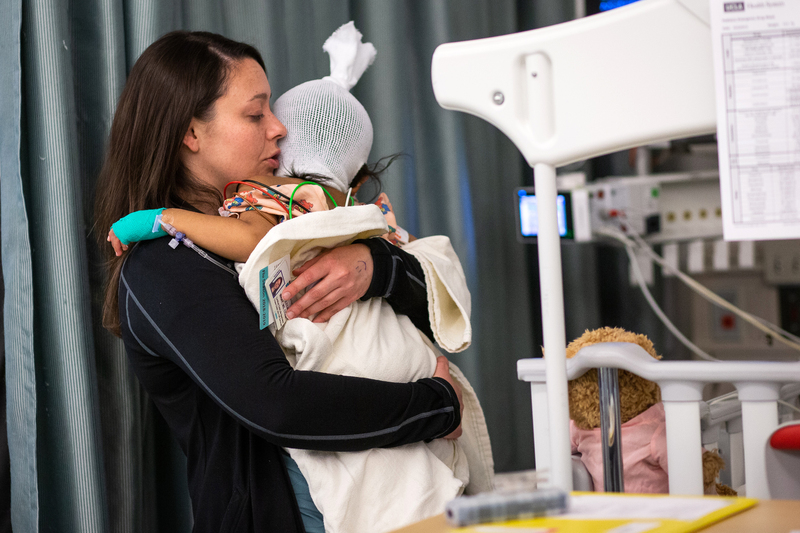 A gentle stroke of David’s head and ensuring Kayla had her stuffed animal by her side have become instinctual, but no less meaningful for Karleen. 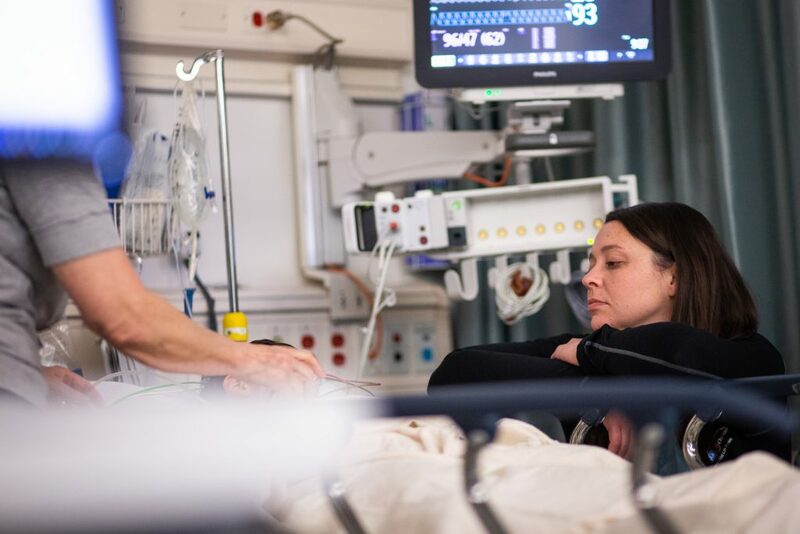 As the day winds down, Karleen receives a call from the Nurses’ station on the 5th floor. 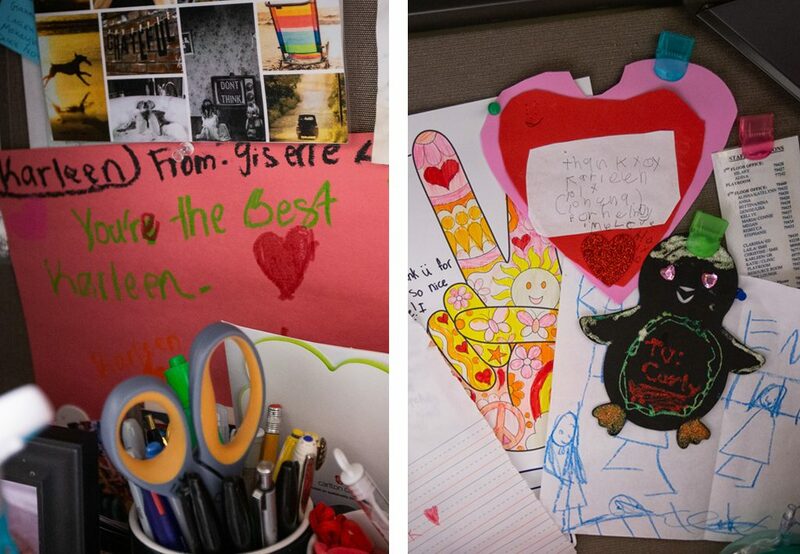 One of her patients is having a rough day and simply needs her Child Life Specialist, Karleen. 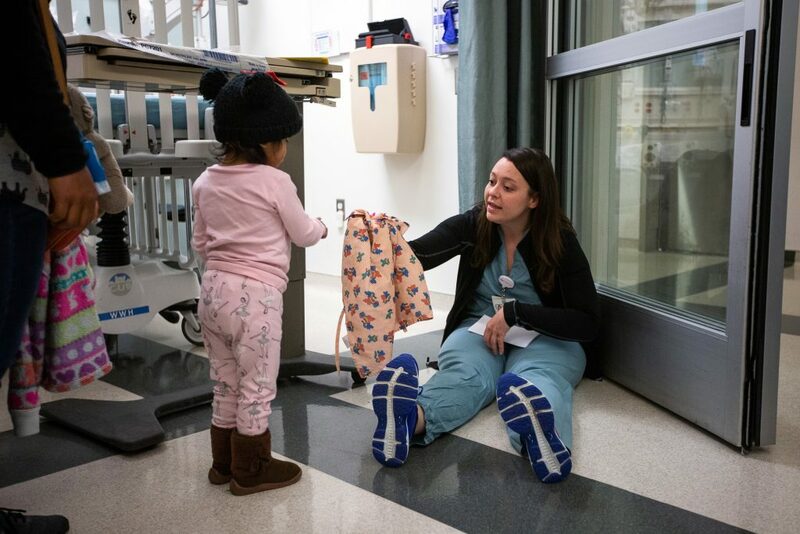 And, while she’s up there, Karleen manages to dash down the hall to squeeze in one more visit with another patient to end her day. Please consider supporting the Chase Child Life Program. 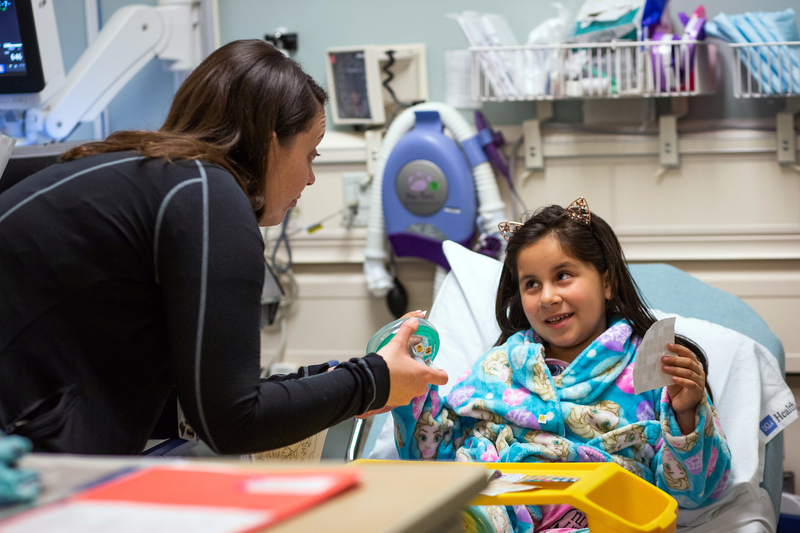 Donations to the program will ensure that young patients continue to receive the best services available. Chase Child Life Program does not charge for its services. Your in-kind gifts, as well as monetary gifts to the Children's Hospital will be used to directly support the pediatric patients and their families.